Round three of the 2017, 2 Machs Motorcycles, Cheshire, Oset Cup saw a record entry of 64 riders taking to the rolling hills of the Frodsham Caves venue. The grassy banks are a great place to start for newcomers to this all-electric championship. Bright sunshine was the order of the day with picnics, on the bank, and suntans getting topped up as the kids took to the sections. William Sagar continued his winning streak and continues to impress. Dropping 11 marks, mostly on the sandy, rocky hill climb of section one. By far the toughest section of the day for the expert class, William was the only rider to get through clean all day. Dylan Ratcliffe brought out his Oset 20 for the day to take second place, just four marks further back. Ellis Barton completed the podium on 23 marks, bravely hitting the hillclimb (as did a few others in the expert class) on a 36 volt machine. Jess Widdowson, another 36 volt rider had a great day finishing 8th overall but with some “backing it in” techniques to rival most of the motoGP paddock on section 4. Joe Powell stepped back to form with a loss of 7 marks to win the C class intermediates, the loose sandy bank and bumpy turn of section 3 taking all of Joe’s dabs. Dan Douglas followed on 10 marks, dropping a few in the woods of section 2. Last round’s winner Aidan Williams followed just one mark further back on 11. Ewan Edwards had a great ride to finish in fourth place on 13, all clean except for the sweeping bank and camber of section one. Returning to the championship was Bobby Kay, getting back into the swing of riding his Oset again in the inters class. C class Novice was again won by James Wyatt, 20 marks lost for the day, well done James. Luke Robinson-Gerrard continues to build his confidence finishing in second place on 34. Lennon Weeder completed the podium in his first ever trial, perhaps the sign of things to come?? Joe Stubbings dropped a solitary three marks on section one to win the D class intermediates, in an otherwise all clean day! Isaac Tilson had a great trial, calmed down his style and has clearly got used to his Oset 20, to finish second place on the day. Dropping the same 10 marks as Isaac, Molly Barber finished in third place with one less clean to her scorecard, some impressive riding by all. Jack Gould travelled down from Scotland and narrowly missed to the podium places, just two marks adrift, excellent stuff. Wes Anderson, followed in his Uncle’s footsteps, had the throttle tapped and chucked the anchor sliding his was to a 43 mark loss. Young Zach Reynolds stepped into the inters class for this season and improves at each round, well done. Dempsey Pickup dropped just 6 marks to win the youth D Novices, a great effort for only his second event of the series. Newcomer Ted Jones followed on 11 marks, the tight turn on section two taking a few marks from the youngster. Ryan Ratcliffe started on one bike and finished on another but still took to the podium on 14 marks. Dyfan Smith recovered from rear mudguard snapping flip during a Saturday practice session to finish in fourth place just one mark further back. Cerys Good and Reuban Rustage both continue to work their way up the youth D leader-board too, it hasn’t gone unnoticed guys, well done. Ioan Lloyd, who’s name I will pronounce correctly at the next awards presentation I promise, took the Youth E Novice win on just 8 marks, great riding. Logan Price followed in second place on 18 marks, whilst chasing his Nan around the course! Rylan Pickupwon his first award of the series with a great third place. Jody Dawson improves at each event, getting more cleans and took a fourth place as a result. Frankie Brookfield wanted to do it all without help on his 12.5 and laughed his way around the sections, brilliant to see! 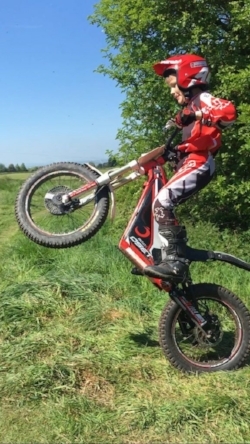 Indeed the ethos of the series is for the kids to enjoy riding their bikes, Luca Lanzi is another great example of this, building his confidence at each trial and one of the youngest competitors of the trial. All in all another great event, sunshine, smiles and a few crashes which is exactly as it should be. Round four of the series is all set for June 18th at Hales Bike and Board Park. Full details to follow soon. Please follow the links below to see full results, updated championship table and video link.